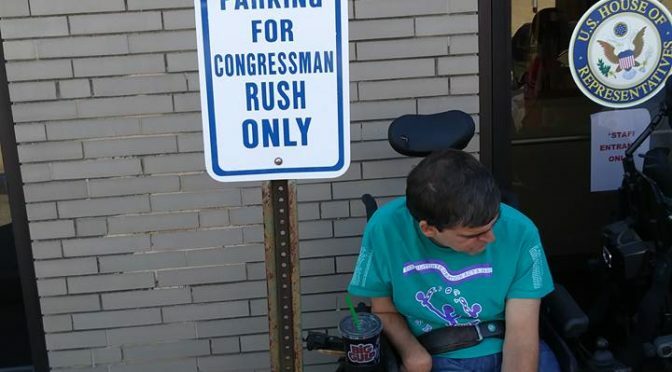 On Friday, the Chicago chapter of ADAPT protested outside the office of Congressman Bobby Rush (D-IL). For over seven hours, a dozen ADAPTers used their own bodies and wheelchairs to block doors on all sides of the building, chanting “just like a nursing home you can’t get out!” The protest was in response to Congressman Rush’s continued co-sponsorship of the ADA Education & Reform Act of 2017, also known as HR620. Critics argue that the bill rolls back Americans with Disability Act protections that motivate businesses to comply with the law. Friday’s protest occurred after Congressman Rush was given 48 hours by Chicago ADAPT to remove his co-sponsorship from HR620, or at least to provide a public written statement indicating that he would do so. 48 hours passed, and his office did not issue a statement. Despite several attempts, NOS Magazine has been unable to get comments from Congressman Rush’s Chicago and DC offices on his position on HR620, his thoughts on the ADAPT protesters, or any other topic. Congressman Rush’s staff would not even confirm or deny reports that the doors at the Chicago office were locked on Friday. Over the course of the day, many protesters expressed disappointment with Congressman Rush’s actions on disability rights issues and his office’s behavior towards ADAPT. This is because Congressman Rush has a rich history of radical activism for civil rights. Anita Cameron, a prominent ADAPTer who has fought for disability rights for over three decades, addressed Congressman Rush directly during a Periscope broadcast. “Hell, you’re an ex-Black Panther. The Black Panthers helped people with disabilities during the 504 sit ins, and that’s the way you’re going to be? … What are you doing that you’ve got to have a locked door to your constituency?” she asked. The protest ended in the evening, when police moved to ticket four people who were blocking one of the entrances. This allowed the people trapped inside the building by ADAPT to leave. Notably, none of the ticketed protesters were full time wheelchair users. According to some sources, there had been police discussion earlier in the day about getting a wheelchair accessible police van to make more arrests, but the van seems to have never arrived. Congressman Rush remains a cosponsor on HR620. What ADAPT will do next remains unclear, as they are notoriously secretive about actions until the action is already in progress. What is clear is that ADAPT will continue to press Congressman Rush on disability rights issues. Follow #ADAPTandRESIST on Twitter or Facebook to see what happens next.